This was another cider that I acquired at Milletts Farm — a sort of strange family-friendly theme-farm/garden centre/petting zoo near Frilford, Oxfordshire where Nor used to go as a kid. We went there a few months back. I reviewed Once Upon a Tree Kingston Redstreak cider just afterwards, but have had a bottle of Worcestershire Wobblejuice in the fridge since then. Worcestershire is produced by Clive’s Fruit Farms in Upton-upon-Severn near the Malvern hills. Proper apple country in other words. It comes in a clear bottle with a nicely designed label that tells the story of the cider and how it was produced. 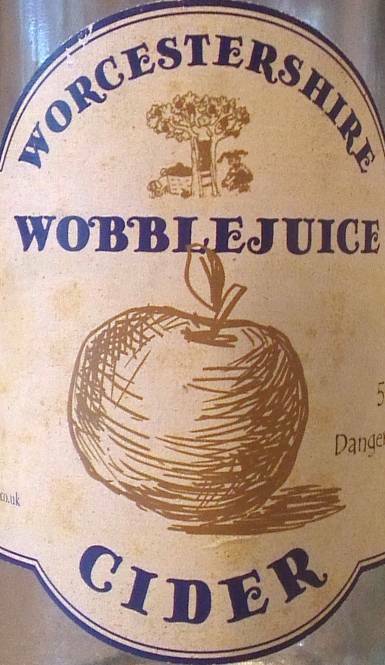 Wobblejuice is a nice yellowy-orange in colour, a bit cloudy and fizzes lightly when you open the bottle. It reminded me a little of a Norman or Breton cider although this is 5.2% alcohol by volume and the general style of the cider was nothing like those much sweeter brews. The initial aroma is robust, a good kick of apple balanced by some nice farmyard notes. The taste is on the dry end of the spectrum with plenty of oak and a good bit of astringency on the palatte. And the delicate fizz is offset by a little bit of sharpness in the aftertaste. The fizz makes it feel like a fancy cider, but one with a farmyard heritage. Overall this is a great drinking cider, accessible but with a depth of flavour and a gentle fizz to it. Perfect for supping while watching a movie with friends as it turns out. I thoroughly enjoyed my very first bottle of Wobblejuice Perry cider, it was unforgettable and i wish i had bought a whole crate as i live in Lancashire: we don't get Perry up here, more's the pity!!. I wonder what Worcester black pear liquer would be like and if it's anything you might have thought about in the past?.